The international ratings agency has knocked Russia’s credit rating down a peg, while warning that ‘growth may not return until 2017,’ as the national economy struggles amid sanctions and tumbling oil prices. Fitch Ratings Inc, with dual headquarters in New York and London, downgraded Russia’s credit rating to BBB- from BBB, which is just one step away from the non-investment field. While not yet the worst rating, Fitch nevertheless predicted a rough road ahead for the Russian economy, which has witnessed a dramatically weakened ruble together with steadily declining oil prices. Fitch said Russia’s Gross Domestic Product will decrease by four percent this year, which is significantly worse than the 1.5 percent decline it had anticipated. "Growth may not return until 2017," Fitch warned. A storm of factors, including plummeting oil prices, turbulence with the national currency and sanctions slapped against the country in the aftermath of the Ukrainian debacle, have made the Russian economy particularly vulnerable. In June, Brent crude was trading at more than $111; on Friday, it was less than $50 a barrel, while the ruble was trading at 63 against the dollar. In an intervention effort to offset the declining ruble, Russia’s dollar reserves took a hit, tumbling from $511 billion to $388 billion over the course of a year. "Plunging oil prices have exposed the close link between growth and oil price [in Russia]," Fitch added. It then lectured on Russia’s overdependence on natural resources: "Commodity dependence is high: energy products account for almost 70 percent of merchandise exports and 50 percent of federal government revenue, exposing the public finances and the balance of payments to external shocks." The ratings agency also warned that Russian inflation, which hit 11.4 percent at the end of 2014, would remain stuck in the double-digits before dropping to 8.5 percent next year. "The prospects of the [Russian Central Bank] realizing its end-2015 inflation target of 4.5 percent now look remote, particularly if the exchange rate falls further, potentially leading to still higher interest rates," Fitch predicted. There were some silver linings, however, in the cloudy report with the ratings agency predicting that oil prices will increase to about $70 a barrel this year. In the event that oil stays at its present historic lows, "it could precipitate a deeper recession and put further strain on public finances, severely limiting the authorities' room for maneuver." 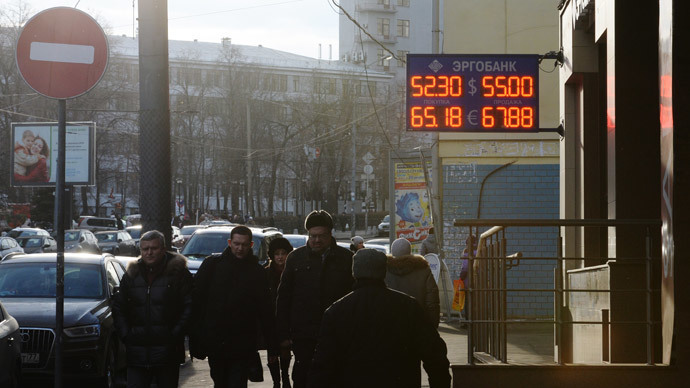 Russia’s economic woes aren’t limited to the country itself. Europe, Russia’s largest trading partner, is feeling the pressure from loss of trade with its huge neighbor. This week, French President Francois Hollande expressed deep concern over what sort of impact Russia’s economic downturn might have on Europe, going so far as to demand an end to the sanctions.